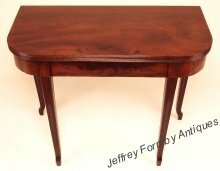 A George III mahogany 'D' shaped tea table with reeded edge moulding. The tapering legs are of an unusual shape with reeded decoration to the legs and fluted feet. A George IV mahogany marine mercury barometer with thermometer and its original brass gimbals mounting; signed on the silvered register plates Geo,, Stebbing Portsmouth Optician &c to her Majesty. An 8-day barograph in an oak case with chart drawer below. The barograph is engraved for the retailer John Trotter Ltd 40, Gordon St. Glasgow. 100, George St. Edinburgh. 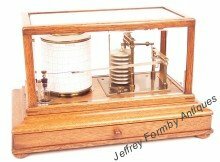 The barograph is complete with its original glass ink bottle and dipper, and a years supply of charts. 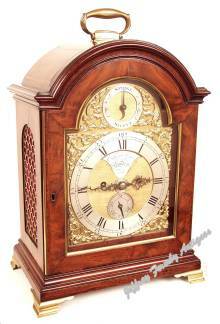 A good English skeleton clock with passing strike mounted on its original coromandel, rosewood and marble base. The base has a silver presentation plaque, engraved Presented to the Revd. W. W. Berry from his affectionate friends on his leaving Farnley 27 July 1852. Farnley is in the borough of Leeds; the 1851 census records a William Berry aged 33 and his wife, daughter and sister, all 4 people being born in Ireland. Height: 20 inches, including glass dome. 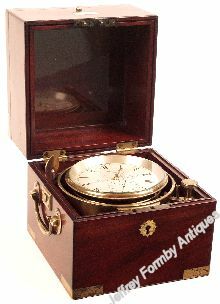 A good 2-day marine chronometer in a 3-tier mahogany box, signed on the silvered dial Richd Hornby Liverpool. 793. This chronometer was owned by Captain Thomas Rankine in the late 19th and early 20th century and used by him on sailing vessels and steamships. A good mahogany cased bracket clock with alarm, signed on a plaque to the dial centre Edward Foster London. The twin-fusee 8-day movement has a verge escapement with engraved back plate and strikes the hours on a bell. The 7-inch dial with date, alarm and strike/silent features, has a silvered chapter ring and brass spandrels. Case height 17 inches including handle. 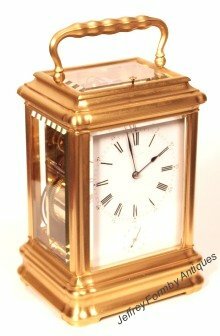 A good French giant striking carriage clock by Drocourt, one of the top French carriage clock makers. The gorge pattern case has been re-gilded. 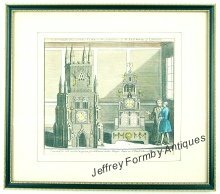 This clock was retailed in London by D.C. Rait & Sons,Goldsmiths to the Queen. Giant sized French carriage clocks, such as this, are not common and are therefore in demand by collectors. Height: 10 inches, including handle. An engraving from the Universal Magazine for August 1748 showing the case and movement of an unusual musical clock with automata. 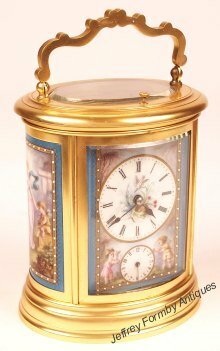 This is a really pretty French oval striking and repeating carriage clock with four Sèvres style blue porcelain panels each with gilt painted and enamel-jewelled borders. 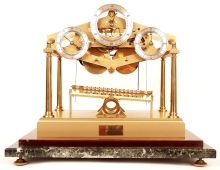 The clock strikes the hours and sounds the alarm on a gong and has its original platform lever escapement. Height: 7½ inches with the handle up. This really is a miniature - it is only 3 inches high including the handle in the up position. 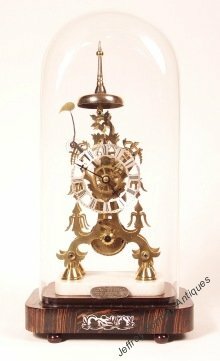 This timepiece is smaller than most miniature French carriage clocks. It is an 8-day French carriage timepiece and it has a rectangular enamel dial and a re-gilded corniche case. The timepiece is stamped on the backplate A. Dumas 543. 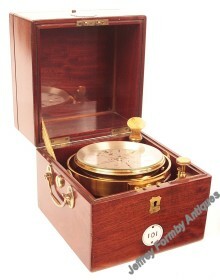 A good 2-day marine chronometer in its original 3-tier mahogany box, signed on the silvered dial Gabriel 24. Bishopsgate St. Within. London. No. 101. The chronometer has subsidiary dials for seconds and state of wind, gold hour and minute hands, and is complete with its original winding key. 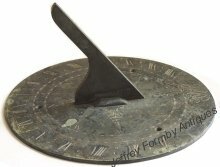 A George II, 9¼ inches diameter, bronze horizontal sundial engraved with the maker's name F Howel, London. Above the maker's name is an engraved monogram. The centre of the dial is also engraved with an 8-point compass rose. 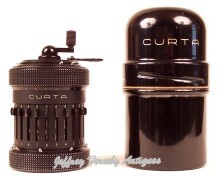 A type II Curta calculator, complete with its original metal canister case. The underside of the Curta is marked System Curt Herzstark Made in Liechtenstein by Contina Ltd Mauren No. 500261. The calculator is sold with a recent reprint of the Curta instruction manual. 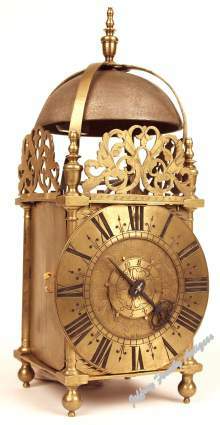 A brass lantern clock, by a well respected late 17th century London maker, signed on the engraved dial centre J Windmills London. The 30-hour, rope driven movement originally had a verge escapement with the pendulum swinging between the trains; it now has an anchor escapement and long pendulum. A high quality reproduction Congreve rolling ball timepiece made by Andrew Fell for E. Dent & Company, London and retailed by Charles Frodsham, London. This clock is number 036 of a limited edition of 150 examples. 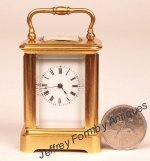 The clock is complete with its original perspex cover with brass corners, and its original winding key. 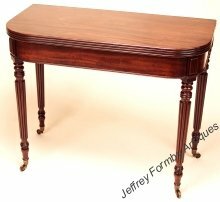 A George IV mahogany, D shaped tea table with folding top, the latter with reeded edge moulding. The frieze has a moulded edge and the turned tapering reeded legs terminate in brass capped brass castors. 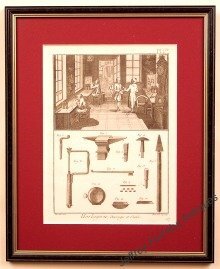 A good plate of this well known engraving showing a French horological workshop at the top and tools from the eighteenth century below. A small 30-hour oval strut timepiece, complete with its original travelling case, made by Thomas Cole, London and retailed by C F. Hancock, Bruton Street, London. 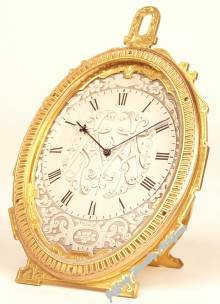 The clock has an engraved and silvered dial measuring 3¼ x 2½ inches and blued steel hands, the hour hand of fleur de lys pattern. The dial centre is engraved with a monogram. 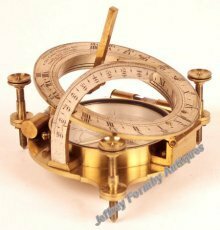 An equinoctial sundial, dating from the second half of the 19th century, housed in its original mahogany box and signed on the compass dial Negretti & Zambra London. The instrument has retained most of its original lacquer. A large French arithmometer with 10 entry digits, 11 revolution counter digits and 20 product digits (ie a 10-11-20 machine), stamped Thomas de Colmar A Paris inventeur No. 1300. The calculator is housed in its original ebonised box with brass stringing, the lid inlaid with brass letters reading Arithmométre.